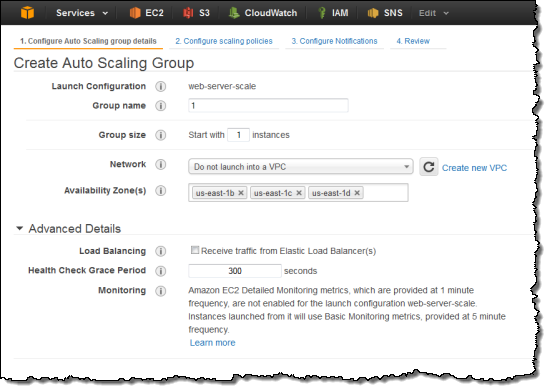 Amazon EC2’s Auto Scaling feature gives you the power to build systems that adapt to a workload that varies over time. You can scale out to meet peak demand, and then scale in later to minimize costs. 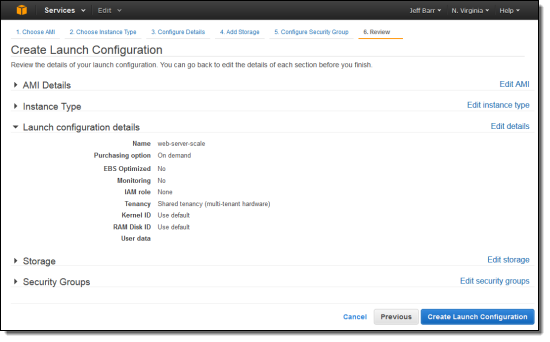 Today we are adding Auto Scaling support to the AWS Management Console. You can now create launch configurations and Auto Scaling groups with point-and-click ease, and you can bid for Spot Instances when scaling out. You can also initiate scaling operations from the console and you can manage the associated notifications. 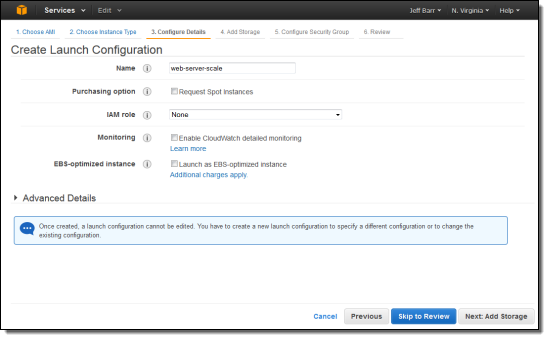 Then you provide a name for your launch configuration, along with an IAM role, enable CloudWatch detailed monitoring, and request EBS-optimized instances. You can even choose a purchasing option (On- Demand or Spot). 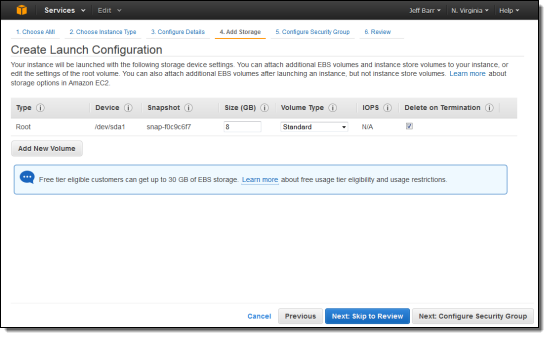 You can also request the creation of new EBS disk storage volumes as part of the launch. These volumes can be deleted on termination, or they can be left around. The first option is perfect if you use the EBS volumes for temporary storage; the second would be appropriate if you generate log files on the instance and need to move them to long-term storage after the instance has been terminated. You can choose to attach an existing Security Group to all newly launched instances, or you can create and customize a new one. 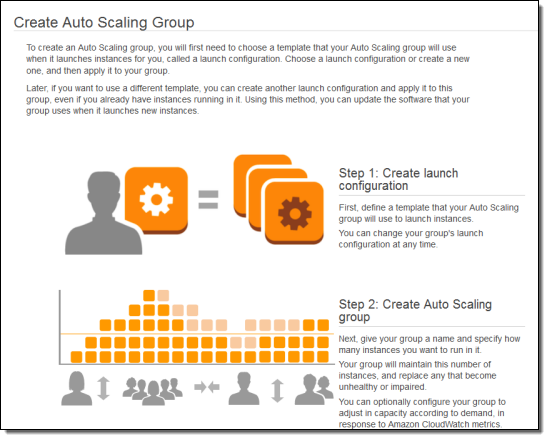 The console will lead you through the steps needed to create your Auto Scaling group. 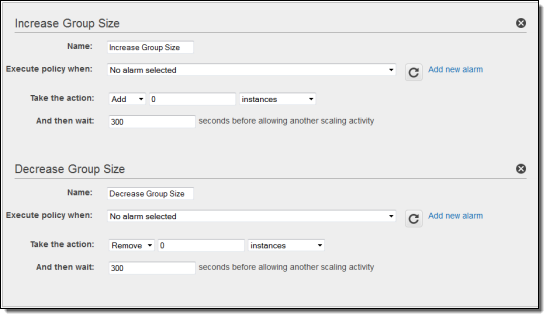 You can set the initial size (number of EC2 instances) of the group, along with the desired minimum and maximum size. 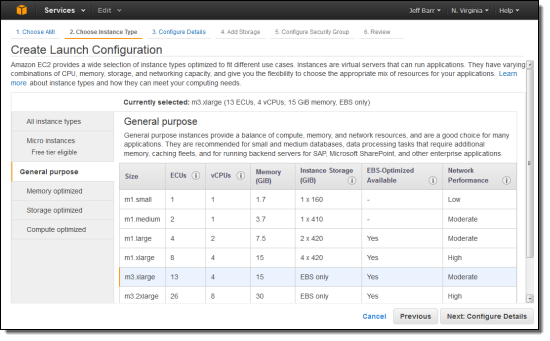 You can also choose to launch the instances into a particular Virtual Private Cloud (VPC), and you can select the desired Availability Zones. The next step is optional. 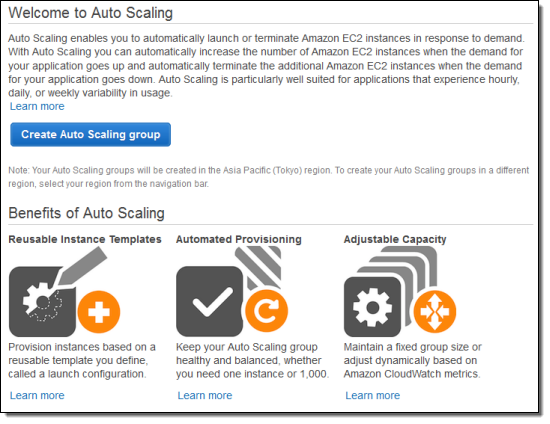 If you are simply using the Auto Scaling group to ensure that a particular number of instances are up and running, you can skip it. If you want the group to vary in size in response to a changing load or to other factors, then you need to set up scaling policies. Groups that vary in size must have a Scale Out policy and a Scale In policy. These policies are triggered by Amazon CloudWatch alarms. For example, you can activate the policies when the average CPU load (across the Auto Scaling group) rises above or drops below certain thresholds. Or, you can activate them in response to changes in the amount of network traffic to or from the instances in the group. You can even create custom CloudWatch metrics such as “Requests Per Second” and use them to initiate scaling operations. 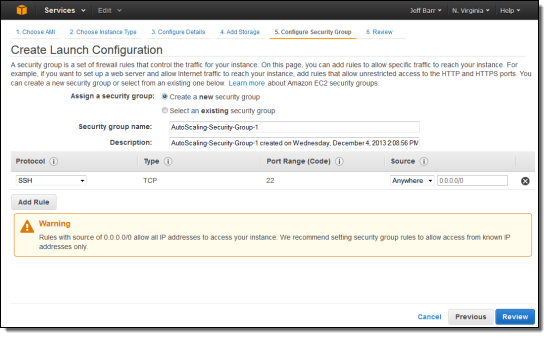 This new feature is available in all of the public AWS Regions and you can start using it today. Give it a try, and let me know what you think.